Batman: The Dark Knight - Exceeded most of my expectations. And almost all the credit goes to the awesome performance by Heath Ledger as "The Joker". 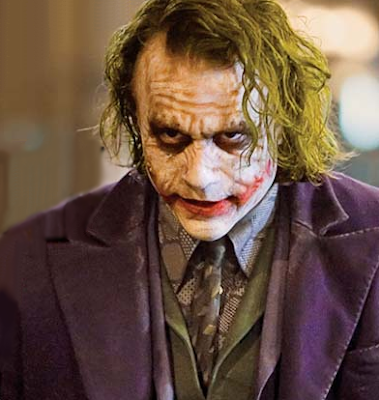 The Joker's scruffy and grungy make-up is intended as a reflection of his "edgy" character. What a performance by him. Amazing... Has become my most fav actor and movie character. but sad to know that there wont be any more movies from him. > I'm a man of simple tastes. > Now I see the funny side. Now I'm always smiling! > It's a funny world we live in. > You just couldn't let me go could you? > This is what happens when an unstoppable force meets an immovable object. > I won't kill you, because you're just too much fun. I think you and I are destined to do this forever. > Do you wanna know why I use a knife? Guns are too quick. You can't savor all the... little... emotions. In... you see, in their last moments, people show you who they really are. So in a way, I know your friends better than you ever did. Would you like to know which of them were cowards? > You'see, madness, as you know, is like gravity. All it takes is a little...push. > The only sensible way to live in this world is without rules. > See, I'm not a monster...I'm just ahead of the curve. > If you're good at something, never do it for free. > You have nothing, nothing to threaten me with. Nothing to do with all your strength. > I don't want to kill you! What would I do without you? Go back to ripping off mob dealers? No, no, you... you complete me. > Never start with the head, the victim gets all fuzzy. > This town deserves a better class of criminal... and I'm gonna give it to them. > It's not about money... it's about sending a message. Everything burns! > Does it depress you, ... To know just how alone you really are? > Do I really look like a guy with a plan? You know what I am? I'm a dog chasing cars. I wouldn't know what to do with one if I caught it. You know, I just do things. > You know, they're schemers. Schemers trying to control their worlds. I'm not a schemer. I try to show the schemers how pathetic their attempts to control things really are. > Nobody panics when things go according to plan. Even if the plan is horrifying. If tomorrow I tell the press that like a gang banger will get shot, or a truckload of soldiers will be blown up, nobody panics, because it's all, part of the plan. But when I say that one little old mayor will die, well then everyone loses their minds! > Introduce a little anarchy. Upset the established order, and everything becomes chaos. I'm an agent of chaos. Oh, and you know the thing about chaos? It's fair. > You've changed things... forever. There's no going back. See, to them, you're just a freak... like me! "Let’s put a smile on that face!" And..... Why so serious? "Without giving anything away, this is an epic film (and trust me: based on the sheer size and scope of the visuals and storytelling, that’s not an overstatement). It’s the “Godfather II” of comic book films and three times more earnest than “Batman Begins” (and f**k, was that an earnest film). Easily the most adult comic book film ever made. Heath Ledger didn’t so much give a performance as he disappeared completely into the role; I know I’m not the first to suggest this, but he’ll likely get at least an Oscar nod (if not the win) for Best Supporting Actor. F**king flick’s nearly three hours long and only leaves you wanting more (in a great way). I can’t imagine anyone being disappointed by it. Nolan and crew have created something close to a masterpiece. "- Kevin Smith.